My thoughts about looking good, thinking good and feeling good about life! On my way home, I’m never in a particular rush and the trains that I need to get home all run every 4-5 minutes, so I’m never on a tight schedule train wise. Which allows me the option to stop off at the shops. This is very handy as there are Waitrose and M&S close to the stations in both of these complexes and I can grab any things I need for dinner easily on my way home. BUT, there are so many other shops that I love…and they’re all close at hand! Option to go shopping is what I said, but It feels more of an obligation/compulsion!!! That is why I call it en-route shopping! I’m not planning to go shopping, I have no list or object in mind, I just pop in for a quick browse on my way somewhere else…they just happen to be on my route! This is what happened today. I finished work, got off the train at Stratford and instead of going straight to my connection, I turned right…right into spending a lot of money! But then again, I had a lousy morning…overslept, cold-shower as I didn’t turn the water on early enough and then the kettle exploded HOT water all over me. Wasn’t a good start to my day, so I needed some cheering up. I needed a treat really, and that is exactly what I gave myself! Picked up my favourite fragrance: Chanel no.19. It is my one true love and I never wear anything else! I normally wait until I can buy it duty free, but I’m not planning any vacations any time soon and I’m running rather low. Such a great fragrance, with the elegance of chanel but it’s not as ‘old’ as No.5. It’s younger, lighter but not overpowering or too sharp/fruity/sweet/strong etc. Had a consultation at Clinique: I was undecided whether I needed a skin-evening primer, or a tinted moisturiser to even my skin tone and create a good base, and as I don’t wear foundation I need something light but that gives some coverage. I came away with their BB cream and I will get back to you on how it works out? …and then of course, I had to buy some eyeshadow as it was of offer! Rococo Nails do great polishes st reasonable prices and in a great selection of colours. I pretty much just picked at random…. I love Neal’s Yard and I use their hand washes and body lotions, but I came across their cleanser and toner and thought I would give them a go. I need a new cleansing regime, as I like to switch it up so my skin doesn’t get ‘immune’ to it (maybe I’m going loopy, but I think my skin does become resistant to cleansing products) and I only like to use organic and major chemical free as it’s better on my skin. Once again, I’ll get back to you on how I find these products. The candles were just there…I felt like I needed some TLC, and scented candles around a nice bath always does the trick. And they were reduced…score! Everyone needs to treat themself from time to time. In my opinion, if you really want something…just get it. Go with your gut reaction and indulge yourself. Go on, whats the worst that could happen? 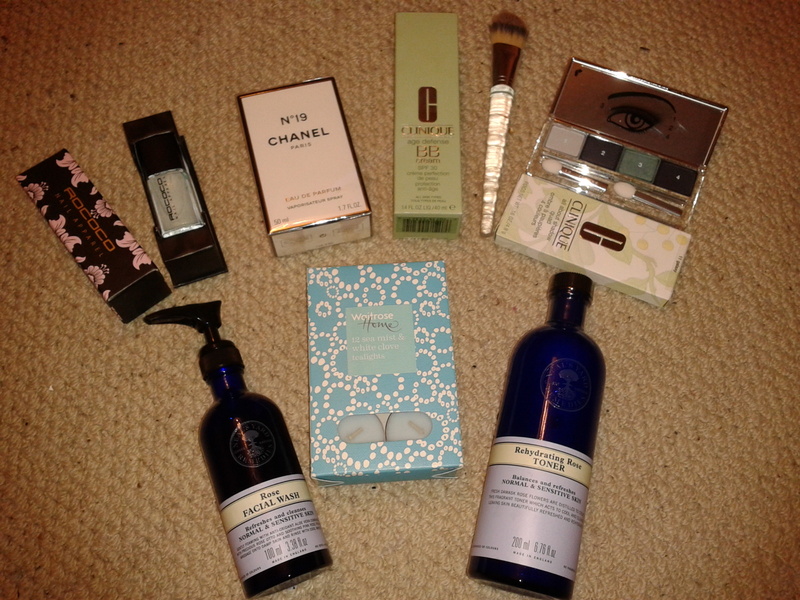 Posted in Beauty Bites, Life Bites and tagged bb cream, beauty, canary wharf, candles, chanel, chanel no.19, cleanser, Clinique, eyeshadow, fashion, john lewis, lifestyle, make up, neal's yard, perfume, rococo, shopping, splurge, stratford, style, toner, treat, treat yourself, westfield. Bookmark the permalink. PR Friendly, loving beauty, fashion and life!